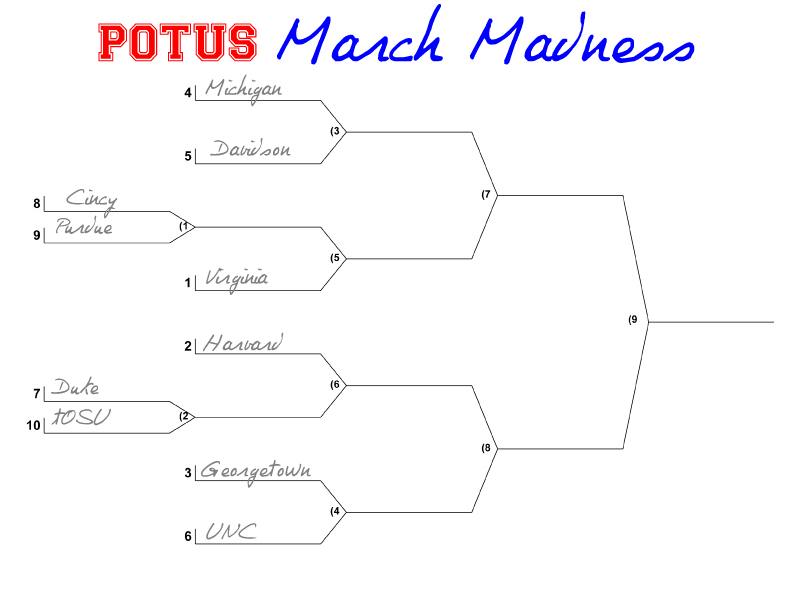 lc blogs: POTUS: march madness: bracket reveal. POTUS: march madness: bracket reveal. So, naturally, I go with POTUS to pick my winner(s). It should be noted that any affiliation with the school counts. So, if POTUS went there and transferred, sat on the board, whatever—it counts. 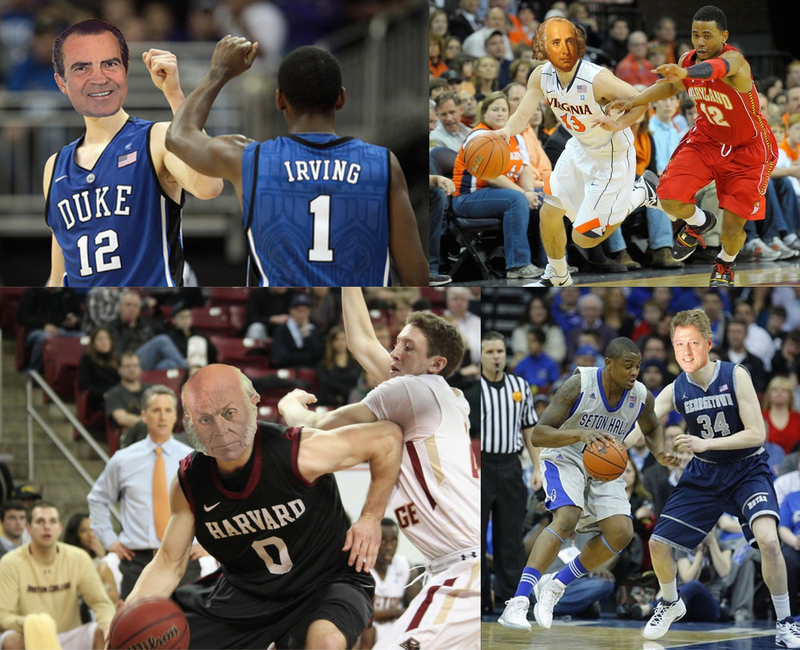 Top left: Richard Nixon at Duke; top right: James Madison at Virginia; bottom leftt: John Quincy battling down low for Harvard; bottom right: Bill Clinton making opponents work for it at Georgetown. (1) Virginia: Small front court, yes. But, let’s be real, we ain’t talking about dribblin’. We’re talking about the guys who wrote the Declaration of Independence, the Constitution and the Monroe Doctrine playing on the same team. (2) Harvard: Just missed out on the 1 seed. I mean, John Adams and both Roosevelts boast impressive (matchless, almost) resumes, but throw in JQA, JFK, GWB and Obama and you’re looking at the bottom. Good thing Adams and the ‘Velts can likely carry them through a couple of games. (3) Georgetown: If this were a tournament for womanizing, these power forwards would waltz their way into history. Unfortunately, it’s not. However, they boast impressive social reform resumes and their popularity among minorities shows a real “team first” attitude. (4) Michigan: Gerald Ford was a lineman, but there’s not a greater Cinderella story in all the land (speaking of course in terms of men who weren’t elected to the Presidency or Vice-Presidency, yet were both). (5) Davidson: Woodrow Wilson brokered peace with Germany during WWI and created the League of Nations. Total team player. And fearless. And smart. Real smart. (6) UNC: James K. Polk is little, but scrappy. He was a go-getter and set goals not to set them, but to achieve them. He's not afraid to battle either. Some could argue that his longtime rivalry with Henry Clay of Kentucky was a pre-cursor to the UNC/UK basketball rivalry of today. (8) Cincinatti: If Howard Taft can quit taking baths and move on to showers (much more manly), he will be a force to reckon with inside the paint. Dude was huge. He’s got a long and impressive rap sheet, but sadly this isn’t a tournament for former Provisional Governors of Cuba. Check the NIT for that. (9) Purdue: Benjamin Harrison couldn’t win the Governorship of Indiana, but he somehow became POTUS. He’s just like a team that can’t win a conference title, but come tourney time— watch out. He could be a sleeper. (10) The Ohio State University: Talk about a bubble team. This guy, technically, didn’t win the right to be POTUS, but oh yeah— we vote a little different in the USA. Can this bubble POTUS pull off the improbable and silence his critics? POTUS: march madness: final four. POTUS: march madness: play-in/ round one. 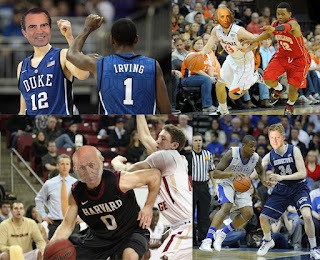 POTUS: march madness: action shots. the bachelor:: ben: final rose. the bachelor :: ben : WTA.